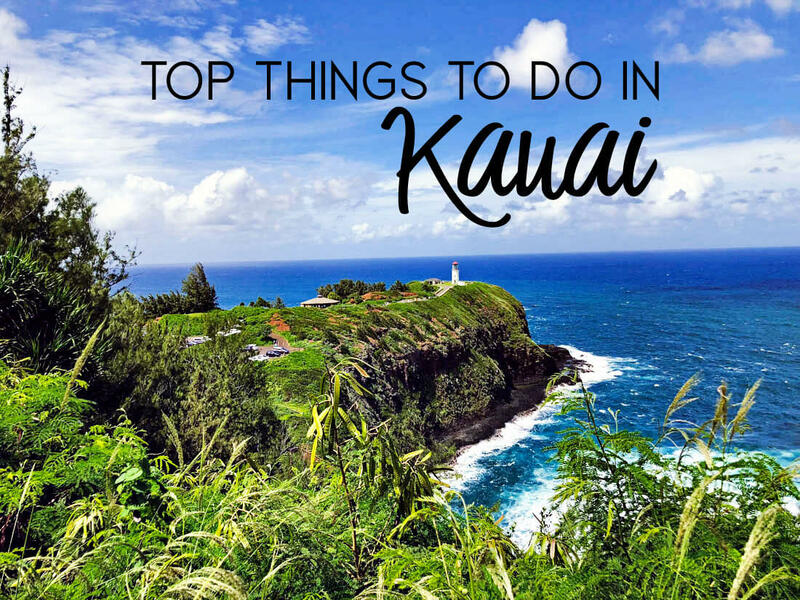 If you’re looking for the most relaxing, beautiful place to visit, the island of Kauai is for you! The oldest island of all of Hawaii. Tourism is the largest industry. 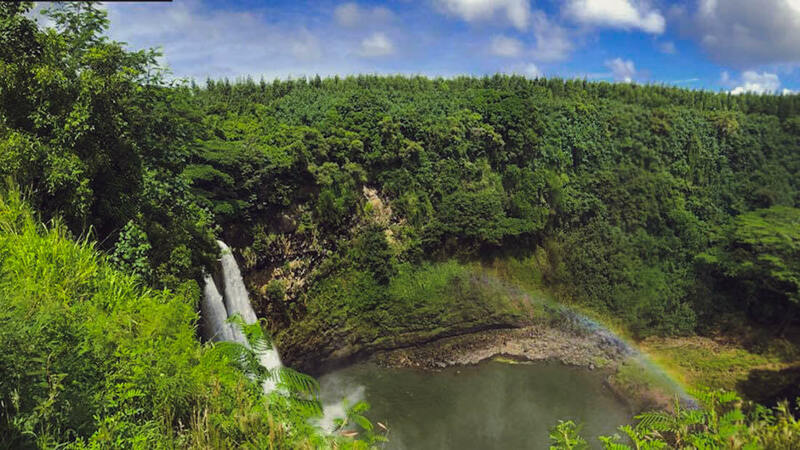 Kauai is wettest spot on earth, with an annual average rainfall of 450-470 inches. Though this year because of the storms it’s said to at least double that! Over 90% of the island cannot be reached by road. It’s home to lots of chickens and “nenes” (Hawaiian geese). There are lots of movies filmed here. Including – Lilo and Stitch, Jurassic Park, Indiana Jones, Mighty Joe Young, Outbreak, Six Days Seven Nights, The Thorn Birds, Tropic Thunder and Hook. 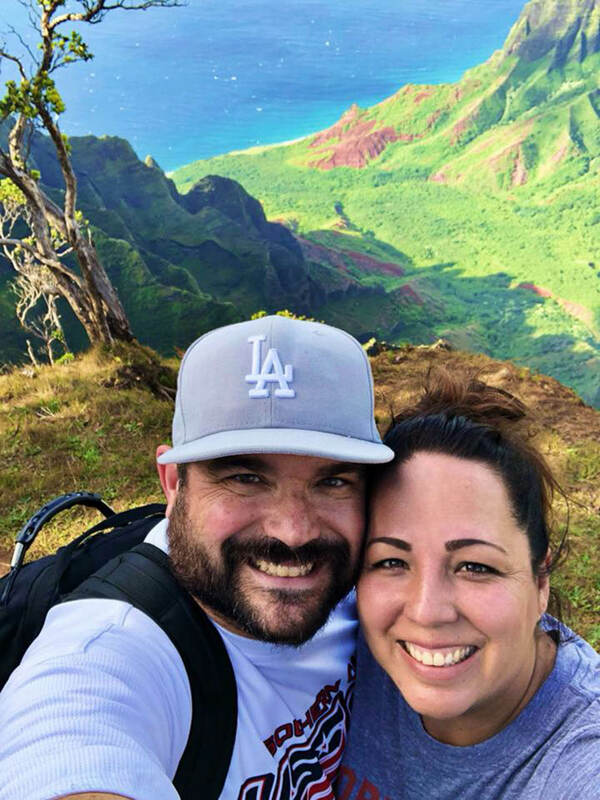 One of the best things about Kauai are the incredible hikes. 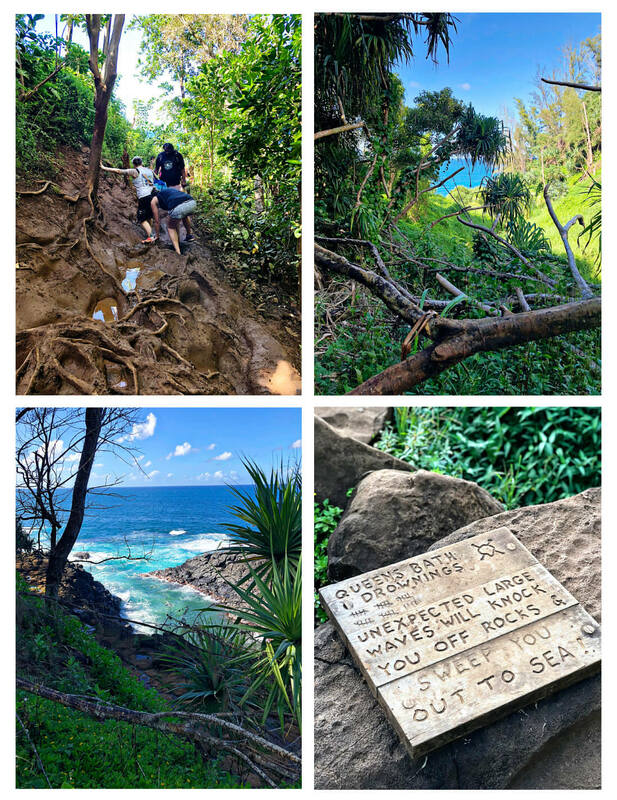 There are so many hikes all over the island with all different levels of activity. Unfortunately because of the flooding earlier this year, everything on the north side past Hanalei is closed down, including the NaPali Coast hikes. Because of this, Josh did research to find some “easy hikes” that we could enjoy. I put “easy” in quotation marks because in the end we found it not easy at all… but still worth it. Originally we weren’t even sure we were at the right spot for the trail. We knew we had to go way up in Waimea Canyon but it just kept going and going and going. We found out later that it’s considered an unofficial trail and isn’t maintained by the island. It’s a hunter access route where people hunt for pigs or goats (though we didn’t see either on our hike). You hike straight down hill and then eventually you have to hike all the way back up (obviously). The trail is unmarked and is really narrow with big cliffs – I wouldn’t feel comfortable taking kids. Wear comfortable clothes and shoes plus bring water. Even though it was more challenging than we expected, it was still one of our favorite things that we did and worth it! But we’ll probably hike some other trails next time. On our last trip we discovered Polihale State Park thanks to our rental car company. It quickly became our favorite spot on the island. 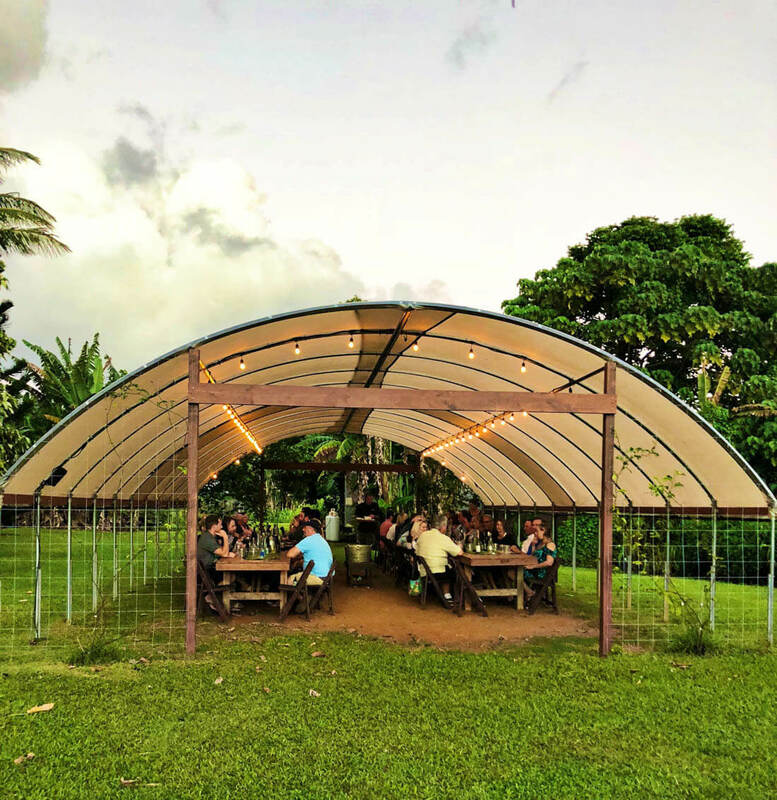 This time – we had quite the adventure going to Polihale. It’s off of a dirt road at the very far west of the island and you can see the NaPali Coast from the south side. Let’s just say – we got our car stuck in the sand- and thanks to some locals, we got out of the sand. Although all kinds of cars go through the dirt road, it is still an uneven road. This time we were in a Nissan Armada and it was much smoother than our Jeep. The best time to go is a little bit before sunset. It’s cooler and it’s absolutely beautiful. Plan on being there to watch the sunset but then leaving right away so you aren’t stuck driving in the dark on a dirt road. We have stayed on the north side of the island a few times now and had never been to Queens Bath. 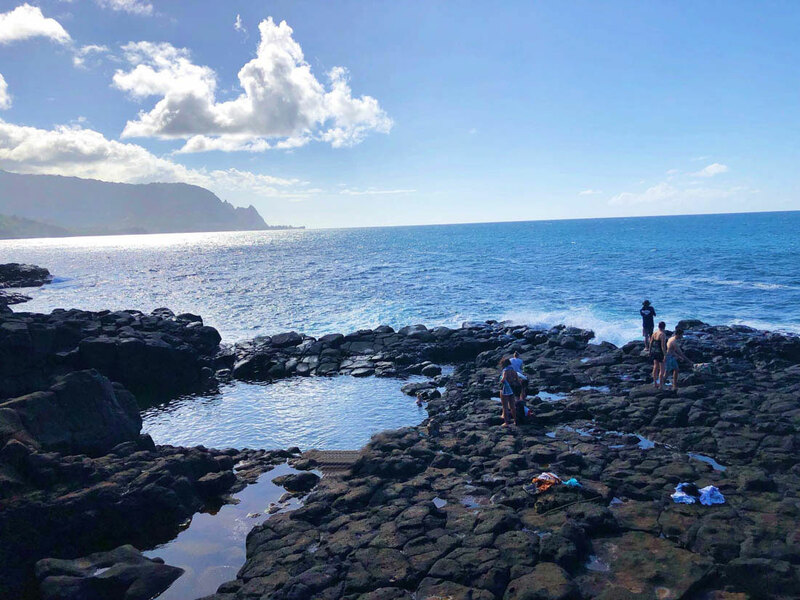 It’s a tide pool surrounded by igneous rock. You have to hike to get to it and though it’s not long, it’s a little tricky because it’s slippery and there are big roots in the ground. We’ve seen Queens Bath from above but for some reason never made it there. This time I was determined to get there and so we made it happen. I’m so glad we did!! Wear a bathing suit, comfy clothes, and good shoes. Bring a towel. At first it will look like you have made it.. keep going! It will become clear when you get to where everyone swims. From October to May the surf can get really big. It’s worth it to check the surf report and make sure it’s not over 4 ft that day. Also worth it to check when it will be low tide and aim to be there at that time. Don’t go too close to sunset because walking back in the dark is dangerous. The parking is VERY limited. If you are staying near there, walk. If not, you might have to wait to get a parking spot. We had to wait about 20 minutes for our spot. There were lots of kids when we went but know going it that it is slippery on the way in and out and can be challenging. Josh and I hung out for about an hour in the sinkhole. The water temperature was perfect, there were fish swimming around us and it was really fun. 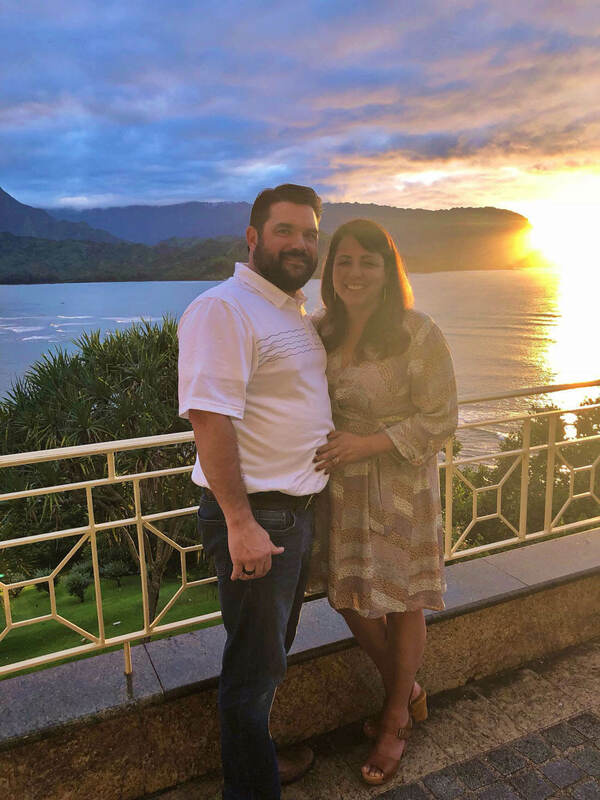 We definitely want to go back next time we go to Kauai! We heard about Wailua Falls from our tubing excursion (below) and since it was close to where we were, we stopped to check it out. The falls were pretty and only took a few minutes out of our day. Supposedly it is a completely different experience if you hike it, but we weren’t prepared for that. Worth a try next time! Parking is extremely limited. You might have to wait to get a spot. After seeing videos on Facebook for tubing down old sugar cane canals on the island, we knew we had to go. Kauai Backcountry Adventures does ziplining as well but they are the only place that does tubing like this. 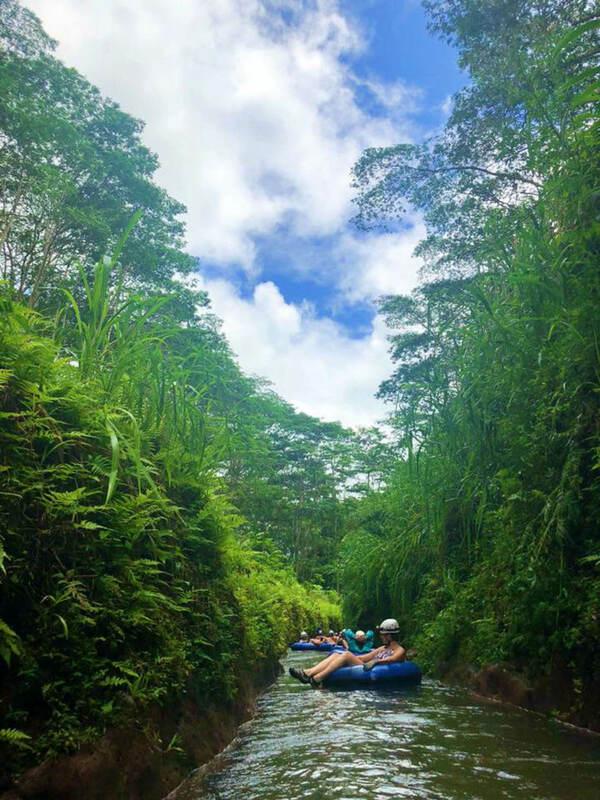 It’s really well organized – with a system in place for everything and options to rent a GoPro to wear as you float down the tubes. If you are claustrophobic, you have the option of getting off after the second tunnel. I don’t love being in tight spaces but the tunnels didn’t affect me. It was worth it! Wear water shoes, a bathing suit and board shorts. Spray sunscreen before you leave. Lunch is served – surprising good! Josh has been into golf for a long time. Last trip he went to Poipu Bay Golf Course on the south side of the island. 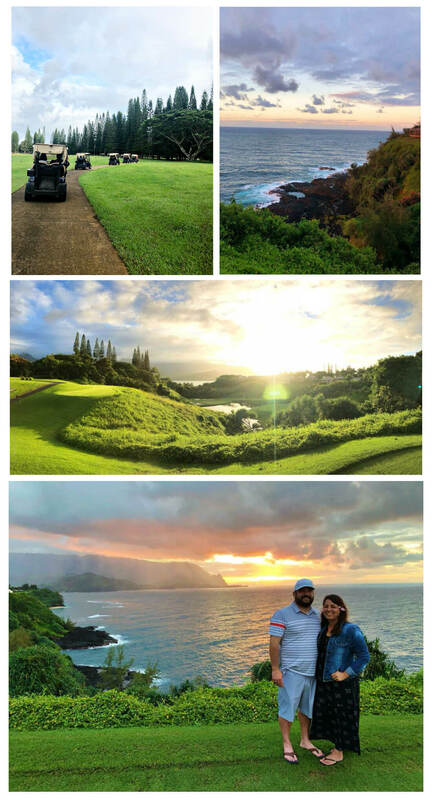 For this trip, we were mainly on the north side and he knew he wanted to golf at Makai Princeville Golf Club. 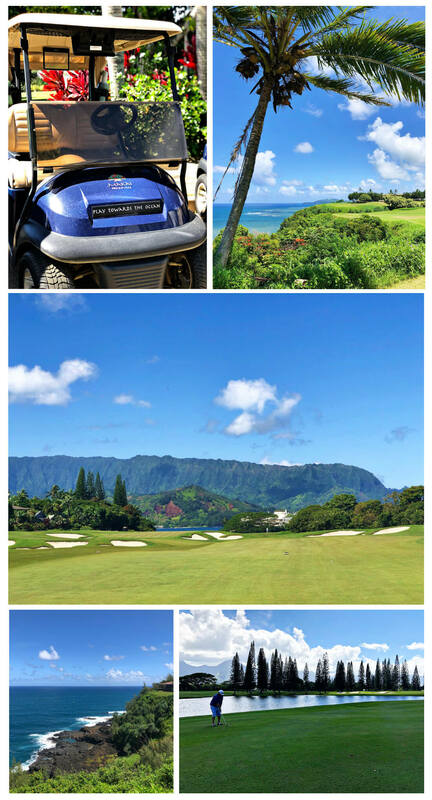 It ranks as Top 100 Greatest Public Golf Courses in America, the #3 in the state of Hawaii and were named to the list of America’s “Top 5 Great Golf Settings” by National Geographic. And let me tell you – it lives up to all of that. They have top of the line golf club rentals – brand new 2018 Callaway Rogues. When you rent clubs- they provide you with 6 logo balls but you need to bring your own gloves. All the golf carts have GPS on them. Every aspect of the golf course is extremely manicured. Even though it’s really picturesque, the pace of play is quick. They have some good specials that are worth looking into. Since I don’t golf, I rode along for the day and took pictures the entire time. I had hundreds of pictures because it was so breathtaking. Being next to the ocean, above Queen’s Bath, in the woods and everything in between.. was incredible. One of the things that we enjoyed the most about the trip was the Sunset Tour at the course. The day we went it was supposed to rain, but we lucked out and it was AMAZING. There were over 30 of us on golf carts with our tour guide, Tom. He remembered everyone’s name and gave information about the island and the course. Even though we’ve been to the island several times, we learned new things and saw things that blew our mind. You get a drink at the start of the tour. They time it so that you get to see all of the best spots on the course and end at sunset. 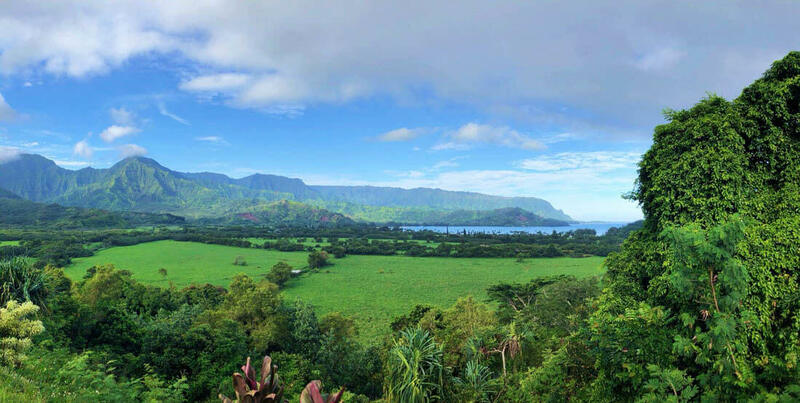 Probably the most known spot in the north, Hanalei Bay is so beautiful. There are shops, restaurants, food trucks and of course the beach. There is a picture spot on the way down to Hanalei Bay. We pulled over and another couple offered to take our picture. We went the beach and to look at the pier because we love it – but sadly it is in the middle of construction from the floods earlier this year. 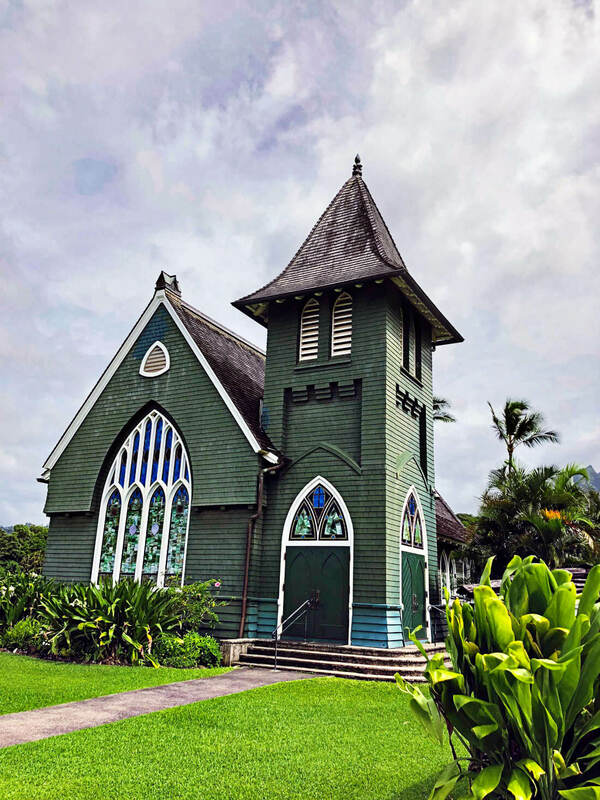 While you’re in Hanalei, drive past the Waioli Huiia Church. It’s in a beautiful spot and it’s iconic on the island. This is a farm to table pop up restaurant. The environment is really cool – as you walk in they seat you on a long table where you have the chance to meet new people. We had fun talking to another couple about our love of the island all throughout our meal. Make sure to spray bug spray before you go. Since it is outdoors, there are mosquitos. The chef presents each course and all of them were fantastic, unique and fresh. A special treat was the hot chocolate and churros. 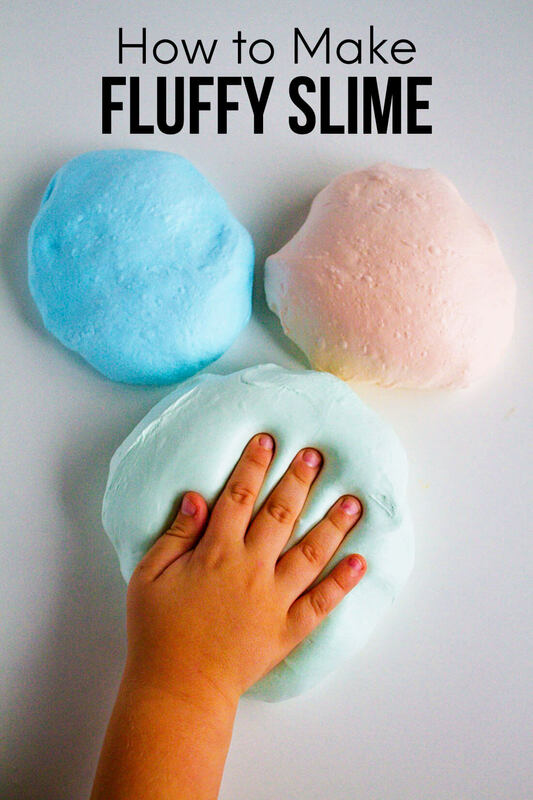 Oh my gosh – incredible! Josh and celebrated our anniversary dinner at the Kauai Grill. We had the best meal of the whole visit that night. There are several options but we ended up with pork belly, surf and turf, filet mignon, mashed potatoes (heavenly!!) and dessert. To say we rolled out of there is an understatement. Set your reservation for right at opening – 5:30pm and be there on time so that you can get a table at the windows where you can see the awesome views. Watch for the sunset and slip out the side door to take pictures on the deck outside. 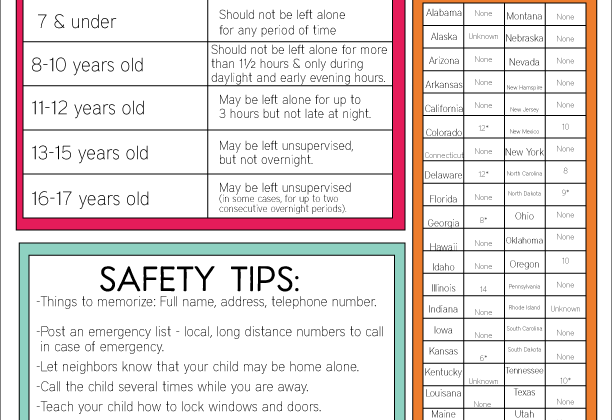 Let them know if you are celebrating anything – they will make it extra special for you. This is on the south side of the island and we drove down specifically to eat it. 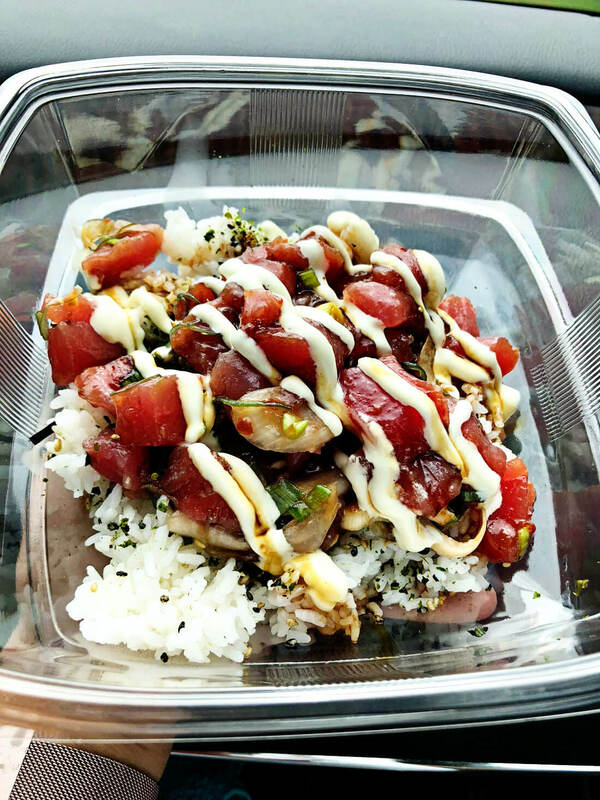 While there are tons of poke options on the island, this bowl is SO SO SO good. Josh got one for me when he went golfing last time and I’ve dreamed of it ever since. It was the exact same as last time. Fresh, perfect rice, yummy sauces and straight up perfection. *You don’t have to play golf to get it – just go to the club house and order one! I got this salad four years ago and have tried to get it probably five times since. Every time I went, they were closed or out of pork belly! But on the last try this time, they were open and had it! Food trucks are super unpredictable on the island. You can look them up on Facebook, Instagram or Twitter but sometimes what they say on social media isn’t accurate. 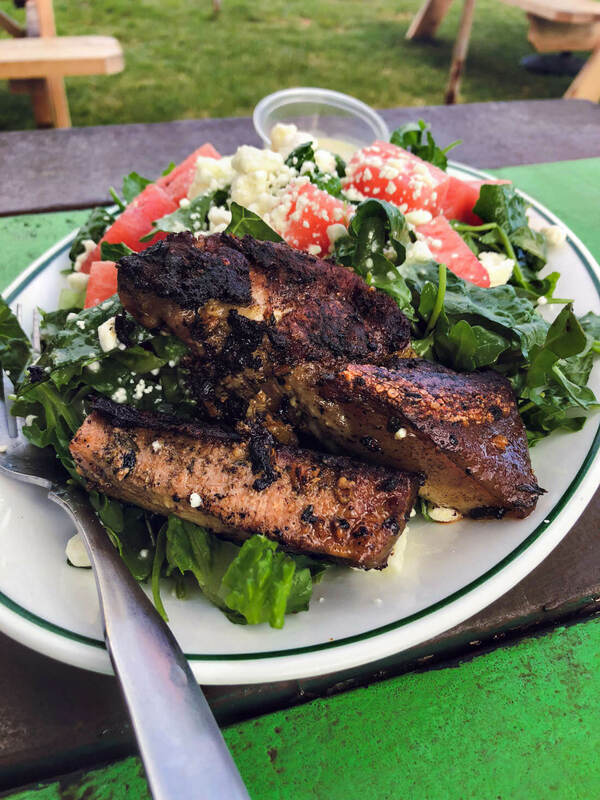 Next time we plan on getting a bike and riding along the coast right across from the Green Pig! This little place was one of our first finds back on our first trip to Kauai. 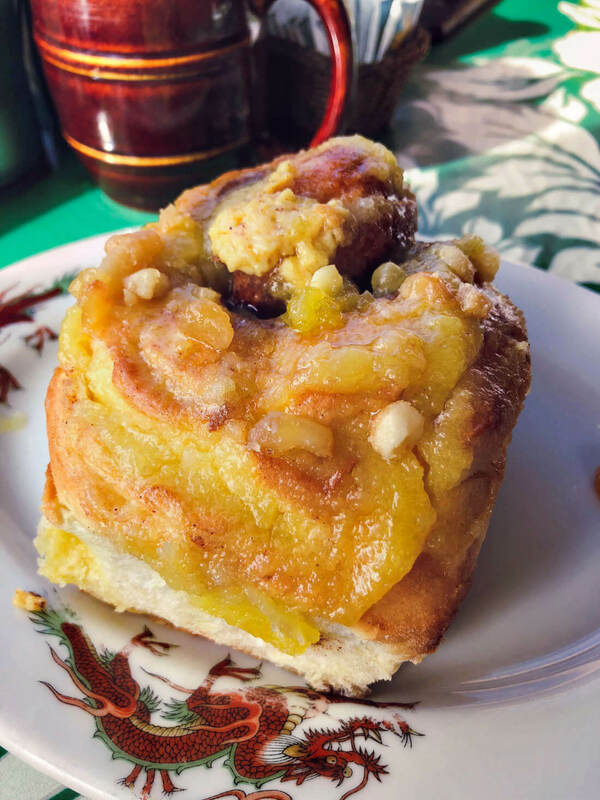 We had the Mac Nut Cinnamon Roll and Over the Falls French Toast. It has been a favorite ever since. If I am up in the north of the island, I have to stop here to get a cinnamon roll. There’s nothing quite like it! It has really mixed reviews on Yelp and Trip Advisor. Sometimes the service can be bad… but so far it has been worth it when I have gone. They are only open from 7am -11am. I’m pretty sure that “Banana Pancakes” by Jack Johnson came from him visiting this spot. 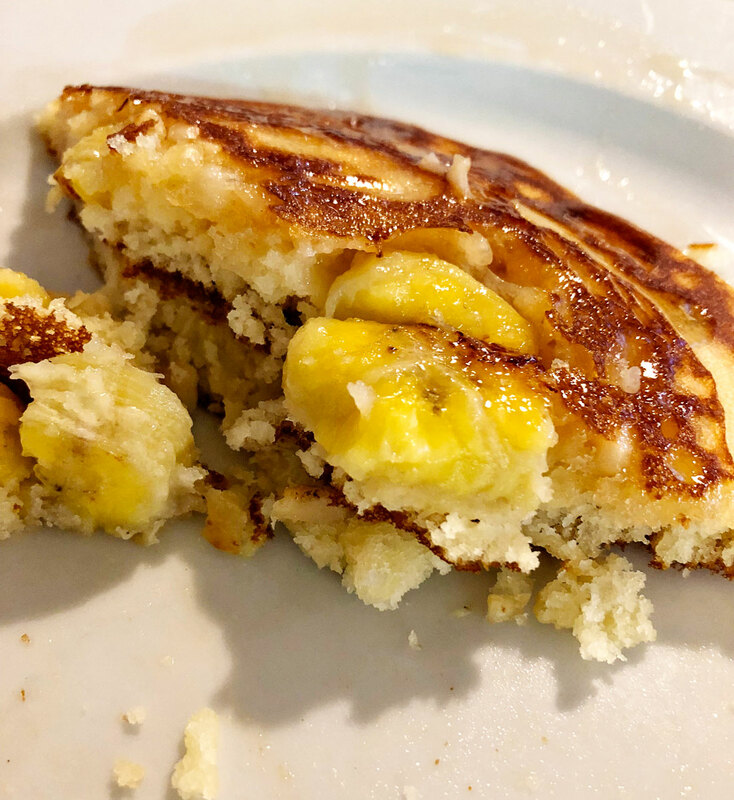 The pancakes are the best I’ve ever had. Josh got pineapple and I got banana with macadamia nuts. HEAVEN. The atmosphere feels like Alice’s Diner or something and supposedly it’s where the locals go. Definitely worth the stop and we will be going back. Pinks Ice Cream and Grilled Cheese: LOVED this so much. The ice cream was soooo delicious and all of the grilled cheese was amazing. Piazza: Whatever you do – get the bread with balsamic. We were practically licking the plate it was served on. The pizza and salad were really good too. It was a nice restaurant. My one criticism was that it was expensive (like the rest of Kauai!). Although none of the food we had was straight up bad, there was just so much good that these are places we probably wouldn’t go back to. Aloha Juice Bar: The flavors were good but the consistency was just kind of weird. Bummer! Kenji Burger: I LOVED my Truffle Burger but Josh got the sushi burrito (which is just a hand roll) and didn’t love it. What’s It Really Like to Go on an Alaskan Cruise? 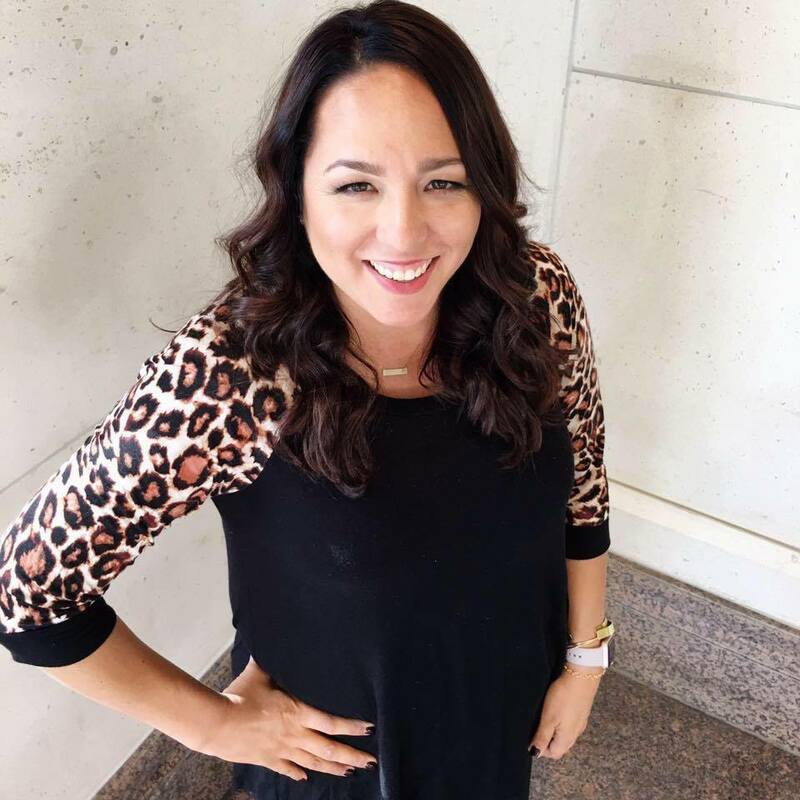 Thank you for this post, Mique! 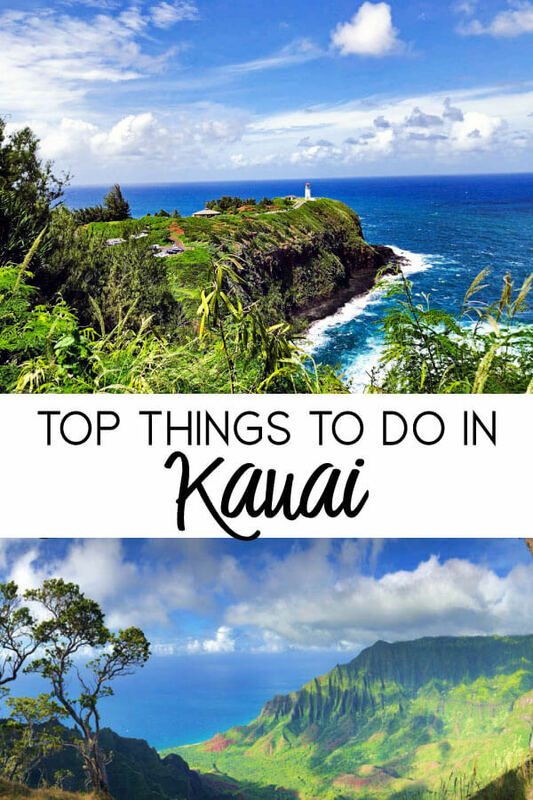 We will be taking our first trip to the islands next April, one of them being Kauai. I will be looking these places and activities up when we get there!